Wagon Wheel Orchard: It's cherry-picking time! 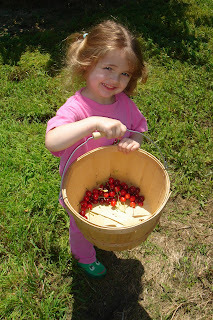 Mid-June is cherry-picking time and the kiddos had a blast picking the tart pie cherries! Unfortunately, we lost all of our sweet cherries to splitting as a result of too much rain near harvest. This is a major source of crop loss in the cherry industry and we experienced it first hand. We were able to pick enough pie cheries for a few pies. But by the time the kids were done eating more cherries than they put into the bucket, we'll be lucky to have enough to make one small pie! Look at that little sweetie with those tart cherries! Not enough for a pie in there just yet though!